On March 12, 1914, the U.S. Congress approved the construction and operation of the Seward-Fairbanks route of the Government Railroad. By June of 1915, the railroad moved its headquarters from Seward, Alaska to a hastily assembled railroad construction town on the banks of Ship Creek. 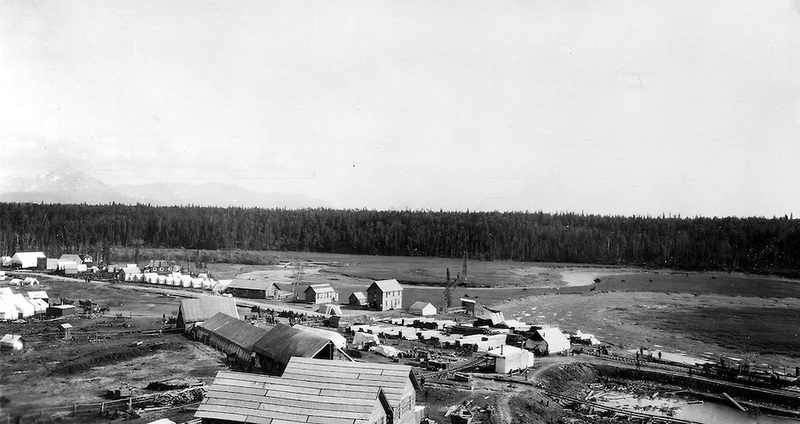 The railroad camp would eventually become the present city of Anchorage. Anticipating the influx of people in the region for the railroad construction and associated support activities and the future potential agricultural and mineral development, the U.S. Geological Survey (USGS) determined it was important to conduct topographic and geologic surveys of the area. For the 1915 summer field season, two USGS parties were deployed to the Turnagain Arm and Knik Arm region of Alaska. James W. Bagley led the topographic survey and Stephen Reid Capps led the geologic investigation. 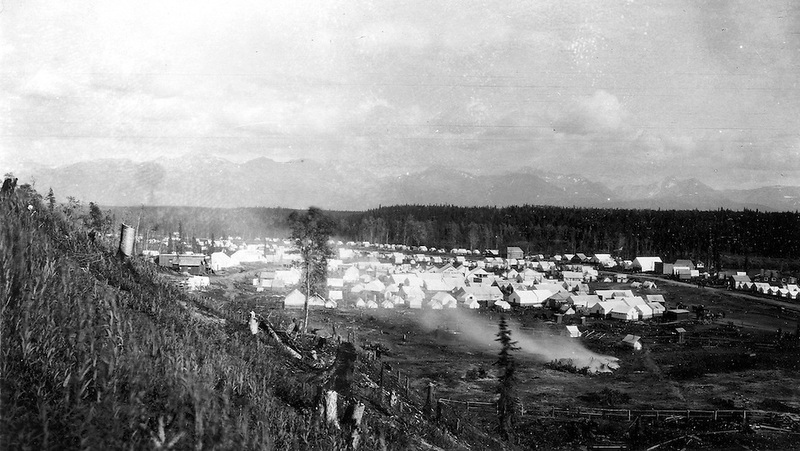 View of the temporary railroad construction town consisting of tents and a few buildings along Ship Creek in Anchorage, Alaska, 1915. Identifiable businesses in the image include: The Crest House, Sourdough Lodging, and Montana Pool Room. Note the recently cut tree stumps on the slope in the foreground and the smoke from the burning pile of brush in the lower right. This image was probably taken from Government Hill within a few days of Capps arrival in Anchorage on June 14, 1915. Photo by S.R. Capps, 1915, U.S Geological Survey Photo Library. Piles of lumber and railroad construction supplies near the mouth of Ship Creek in Anchorage, Alaska, 1915. This image forms a panorama with the previous image. The Montana Pool Room is visible near the left edge of the image. This image was probably taken from Government Hill within a few days of Capps arrival in Anchorage on June 14, 1915. Photo by S.R. Capps, 1915, U.S Geological Survey Photo Library. Modern satellite image map showing the current development of the Ship Creek area of Anchorage, Alaska. Capps probably made the images of the railroad camp from Government Hill. The above map includes a camera icon that’s located at my estimation of the general location of the original 1915 photo. When the snow melts this spring, I plan on finding the exact location and repeating these images. The construction of the Government railroad from Seward to Fairbanks has led to a demand for information about the tributary regions. Most of these had been mapped and investigated in previous years, but there were some areas east of Knik Arm and in the Talkeetna Mountains about which little was known. Two parties ware detailed to explore those regions. J.W. Bagley devoted the early part of the season to extending the topographic reconnaissance north of the previously mapped areas in the Talkeetna Mountains over an area of 835 square miles. He also surveyed an area of 150 square miles in the Knik and Turnagain Arm region. Pack-train transportation was used, and fieldwork began on June 6 and continued until September 5. Mr. Bagley’s surveys were much hampered by the smoke of forest fires in the early part of the season, and later he lost nearly three weeks because of the nondelivery of some supplies, owing to an accident that was caused by no fault of the contractor. S.R. Capps, with a pack train and two men, studied the geology of the Knik and Turnagain Arm region, investigating the geology, of an area of about 1,200 square miles. From June 14 to September 12 was devoted to fieldwork, but about a week of this time was spent in investigating the mining developments of the Willow Creek district. This is part one of series of posts that I plan to do about Capps and his work. Please feel free to leave me a comment or let me know if you have questions. Follow me (@RonKarpilo) on Twitter for updates. November 26, 2010 | Filed under Stephen Reid Capps and tagged with Alaska, Anchorage, Geology, Stephen R. Capps, U.S. Geological Survey.